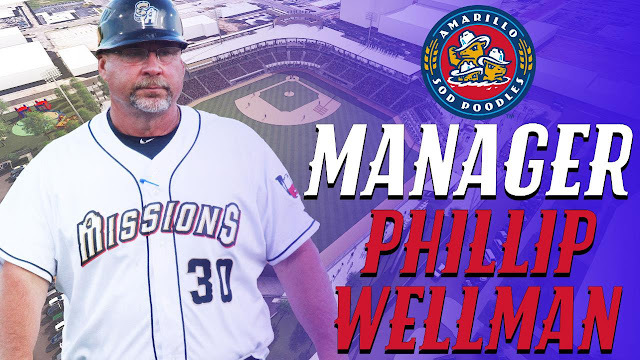 The Amarillo Sod Poodles in conjunction with the San Diego Padres announced Thursday that Phillip Wellman will serve as the team field manager for the inaugural 2019 season. Accompanying Wellman will be pitching coach Jimmy Jones, hitting coach, Raul Padron , coach Freddy Flores, athletic trainers Nick Coberly and Drew Garner, and strength & conditioning coach Drew Heithoff. Wellman returns for his fourth season in the Padres organization managing their Double-A affiliate. The 2019 season will be Wellman's 31st as a coach and 20th as a minor league manager. The 2017 Texas League Manager of the Year piloted the 2018 Missions to a 71-67 record (.514), clinching their second consecutive playoff bout and leading the squad to their first Championship series appearance since taking the league title in 2013. Wellman's managerial career began in 1992 with the Baltimore Orioles Gulf Coast League affiliate. He has also managed Winston-Salem (Cincinnati Reds High-A) of the Carolina League (1996), Burlington (Cincinnati Class A) of the Midwest League (1997-98), Chattanooga (Cincinnati AA) of the Southern League (1999, 2001-2003), Mississippi (Atlanta AA) of the Southern League (2007-2010) and Arkansas (Los Angeles Angels of Anaheim AA) of the Texas League (2014). In 2008, Wellman led the Mississippi Braves to a 73-66 record and a Southern League championship. In 2017, while with San Antonio, he eclipsed his 1,000th win as a minor league manager in April, finishing the 2017 campaign with 1,073 career wins. In 19 total seasons as a manager, Wellman is 1144-1215. The 57-year old skipper was born in Marlin, TX, but grew up in San Antonio, Texas. Wellman attended Madison High School, graduating in 1980. "I am very excited to head to Amarillo," said Wellman. "It's not every day you get to be the first to manage and play in a brand-new stadium in a community filled with so much excitement and anticipation, and the fact that it's in my home state of Texas makes it that much more special. I look forward developing players and getting them to the Big-League level. With development comes winning and as long as the lights and scoreboard are turned on every night, my expectation is to win." "The Sod Poodles are thrilled to welcome one of the most experienced and competitive managers in professional baseball," said Amarillo Sod Poodles President and General Manager Tony Ensor. "With Phillip's leadership, knowledgeable coaching staff and a roster full of talented prospects from the San Diego Padres, we couldn't imagine a better way to begin our inaugural season. Year after year, our goal will be to compete for a Texas League Championship and bring the title home to Amarillo. Phillip is one of the most charismatic and community-oriented managers in the game that we know our fans are going to love and we can't wait to welcome him to our city." "We're excited to have Phillip lead the Sod Poodles on the field in their inaugural season," said Padres Director of Player Development, Sam Geaney. "Phillip is an experienced baseball man with deep roots in the Texas League. Sod Poodles fans will come to appreciate Phillip for his, at times, fiery personality on the field and aggressive brand of baseball his team will play." Jones, 54, enters his 11th season with the Padres after guiding the San Antonio Missions pitching staff for the past eight seasons. In 2018, he led Double-A farm arms to a Texas League second-best 3.58 ERA over 1,212 innings pitched, which included two Texas League top-10 pitchers, southpaw and number eight-rated Padres prospect Logan Allen (10-6, 2.75) and number 11-rated prospect Cal Quantrill (6-5, 5.15). The Padres organization hired him in 2008 to be their pitching coach in Peoria for their rookie-level affiliate. He moved up to San Antonio in 2011, and spent a short time in San Diego in 2012 as interim bullpen coach for the Padres after Darrel Akerfelds was hospitalized with pancreatic cancer. Jones played nine seasons professionally, retiring in 1995. The Dallas native played for the Padres, Yankees, Astros, Expos and even spent two seasons in Japan. Padron returns for his fourth season with the organization and second with the Double-A affiliate after serving as hitting coach for Class-A Advanced Lake Elsinore in 2017. The 34-year old played professionally for 12 seasons after originally signing with the Oakland Athletics as an international free agent in 2002. He made his professional debut with the AZL Athletics in 2004 and split time with all four remaining levels of the A's system until 2009. Padron played in the Texas League in 2009, batting .275 over 39 games with Midland. Padron's other affiliated ball experience came in 2011 when he played 55 games for Akron (Cleveland Indians AA). The former catcher/first baseman also played in the Venezuelan Winter League from 2007-2015 and in the independent Atlantic League for the Camden Riversharks from 2010-2013. Flores, 44, joins the Amarillo staff for his first season as fielding coach and third with the Padres, previously serving in the same capacity for Class-A Advanced Lake Elsinore. The New Mexico native played independent league baseball from 1997 to 2000 and, at the same time, was working as an assistant coach for the softball team at Western New Mexico University. In 2002, he became the head coach and held the capacity through 2007. Flores returned to professional baseball in 2008, playing for another eight seasons including time as a player-coach with the Abilene Prairie Dogs (2012, North American League), Amarillo Sox (2013, American Association), and Amarillo Thunderheads (2015, American Association) before retiring in 2016. The Sod Poodles training staff will be led by athletic trainers Coberly and Garner, and strength coach Heithoff. The Sod Poodles will open the 2019 campaign on Thursday, April 4 at Whataburger Field in Corpus Christi where they will square off against the Corpus Christi Hooks (Houston Astros) for the first of four games. Following the series, the Sod Poodles will come back to Amarillo for their inaugural home opener on Monday, April 8 against the Midland RockHounds (Oakland Athletics) for a three-game set. First pitch for the home opener is scheduled for 7:05 p.m.